Thanks to the Mars Reconnaissance Orbiter and the HiRISE camera, we have an orbital view of Dingo Gap, an opening between two low scarps which is spanned by a single dune. This gap and dune are visible both from the ground and from orbit. The Curiosity Mars rover has now crossed the gap and is continuing its travels toward enticing science destinations, including interesting veins and mineral fractures. In the orbital image from HiRISE, the rover itself is not in this image as it was acquired before MSL landed. However, the imagery was likely used to help the rover team decide on the way to travel. Below are more images of Dingo gap before and after the rover plowed its way through the sand. 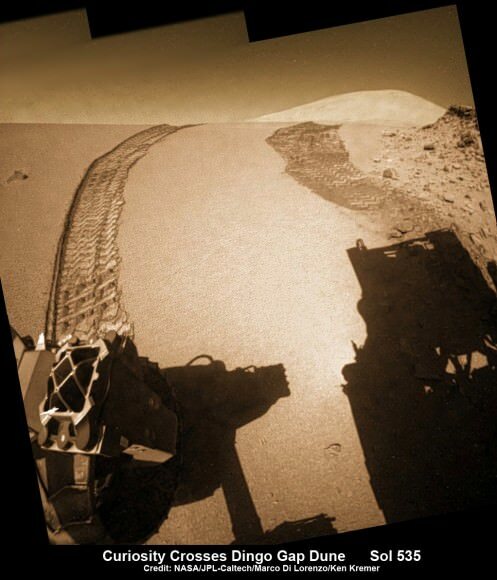 The Curiosity rover looks back at the tracks it left after crossing through the Dingo Gap sand dune. Credit: NASA/JPL, Caltech. Via Doug Ellison on Twitter. The orbital view of Gale Crater and the Dingo Gap region. Credit: NASA/JPL/University of Arizona. Curiosity looks back to ‘Dingo Gap’ sand dune after crossing over, backdropped by Mount Sharp on Sol 535, Feb. 5, 2014. Hazcam fisheye image linearized and colorized. Credit: NASA/JPL/Marco Di Lorenzo/Ken Kremer- kenkremer. I’m happy to see that they use the extraordinary capabilities of the rover to take a modest risk, instead of doing everything in the safest possible way. Time passing is the only unavoidable risk which will destroy MSL one unhappy day. Carpe diem! Or rather: Carpe Sol!